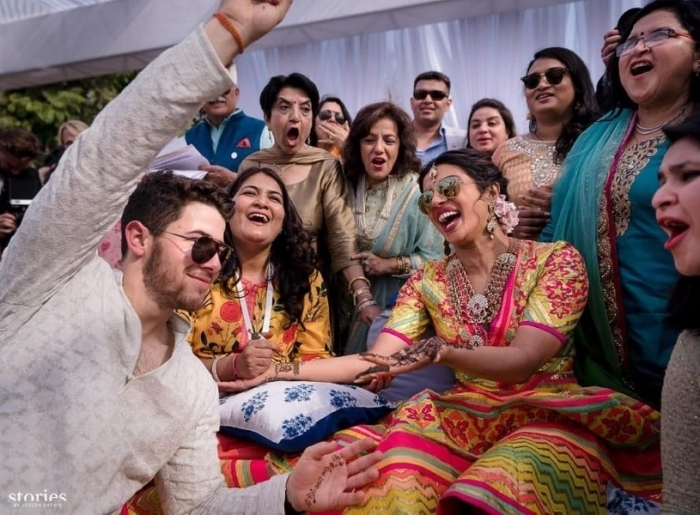 Priyanka and Nick finally shared pics from their mehendi ceremony which showed the bride to be wearing a colorful Abu Jani Sandeep Khosla and the groom to be wearing a white embroidered kurta and pants. If this a teaser of what awaits, then we can hardly wait.? Love love love her outfit! Such a fun look. They look so happy n content… best wishes to them! Gosh! I love this look on PC. It’s so fresh and colorful and fun, depicting exactly what the event should be. Love the flowers in her hair. Love their simplicity in clothes and style.. soo easy going Nick looks… They are enjoying their wedding ! OMG .. pure joy! And lovely colors for mehendi! And of course, congratulations to the couple!! My heart is bursting with joy when I look at these pictures ! So colorful and so fun! 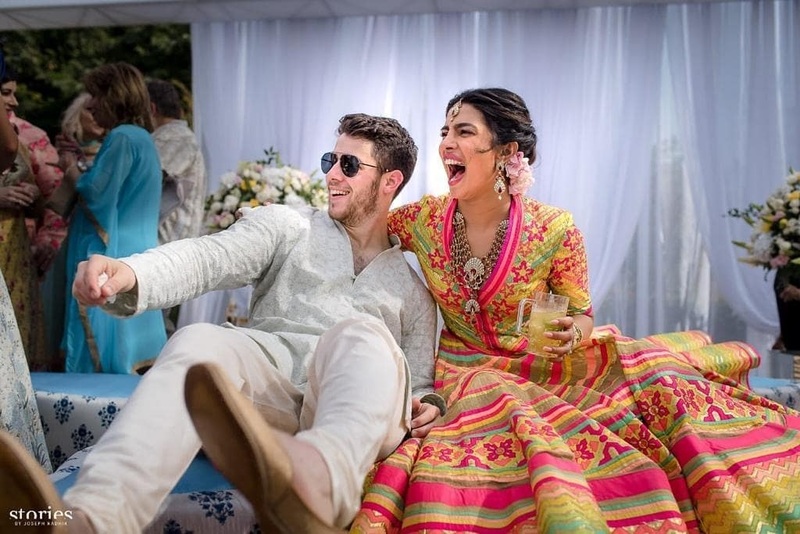 PC is going to rock her wedding festivities and I, for one, can’t wait! I wouldn’t ever go even 20 kms within that outfit. It’s so loud (for me) and I would feel extremely intimidated by that lehenga. But I have got to admit that it looks GREAT on pc, she is totally owning it! I can see why she picked it, it goes well with the place, the occasion etc., love her jewellery and she looks lovely. Breath of fresh air PC’s outfit is!! Can’t believe it’s AJSK… job well done! There’s so much happiness oozing from these pics, makes my heart happy!!! Refreshing pictures after the styled, selective pictures from the other wedding. Looking like a fun normal wedding scene. Why do we need to drag others down..
PC looks radiant! Such vibrant colors and beautiful pics! Wow ! Absolutely lovely. The outfit is simple but the colors are so vibrant ! 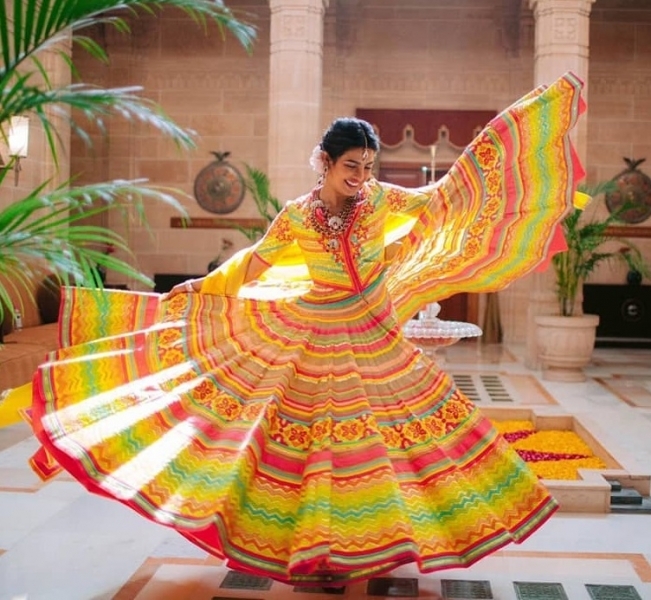 Very rajasthani. Boy was I wrong. I think the difference is the huge, genuine, insanely happy smiles! Really I am getting a sense of deja vu feeling in how all them have been photographed – similarish poses, big big big smiles (not that there is anything wrong with that) and also what’s with the glasses pic? Is it a question of the same photographer and his carefully curated shots I wonder? Their clothes on the other hand have been very different! And the women have each brought their individuality to the frames just by being such stars they are! Although I am not a fan of the dress, PC looks great. They all look really happy. These pics had me smiling. So vibrant and joyous. That’s how a wedding should be! Nick looks classy as ever. This looks like real wedding. Waiting to see the next events. Aah finally some colour after the overdose of beige and off white !! Love PC’s look and love the easy, laid back vibe that these pictures give off.